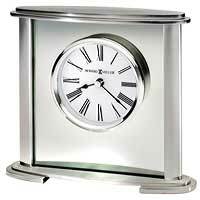 The Howard Miller 645-766 Argento Aluminum Desk Clock is a contemporary brushed and polished silver-finished arch tabletop clock. 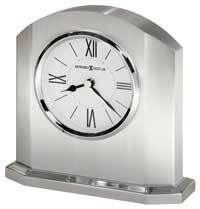 The front of the clock is brushed aluminum with contrasting, highly polished edges mounted to a brushed aluminum base also with polished beveled edges. 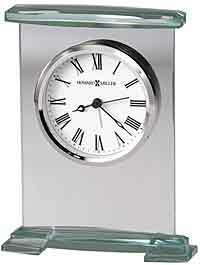 White dial with polished silver-finished center disk and a polished silver-tone ring around the dial. 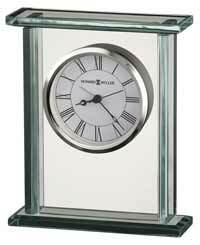 Polished silver finished Arabic numerals and hour markers, black hour and minute hands, silver second hand and a glass crystal. A full felt bottom protects your desk or tabletop. Accurate, Quartz movement includes one AA battery. 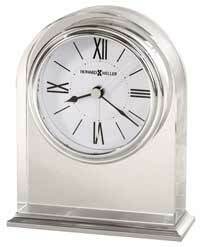 Size: Height 6.25" Width 5" Depth 2"
Clocks for sale at The Clock Depot including the 645-766 at discount prices.